“ASPIRE” – Six Steps to Healthy Meal Planning | Alexia Lewis R.D. The one best thing you can do to make healthier, nutrition-rich meals, save time and money, and make life easier is to plan your meals ahead of time. You need a strategy to plan healthy meals. If you wait until you are hungry and tired at the end of the day, figuring out what to make for dinner is not easy and you’re more likely to choose something fast, easy, and unhealthy. However, this is one of the things that my clients find the hardest to do. I’m here to help you “make nutrition easy,” so here is my strategy for you. Grab some paper, a pen, and ASPIRE to plan your meals. Remembering this acronym will guide you through a simple way to plan meals that are healthy, yummy, and reduce your grocery expenses! I designed my free Weekly Menu Planner just for this! You can use any format as long as you have one column for each day of the week. The first thing to do is check your agenda for any commitments, meetings, and changes to your usual schedule. Also check the calendars of the others in your household. This is important so you know which nights you have time to make a meal and which nights you don’t and should plan for leftovers. It also lets you know which nights you need quick and easy meals and which nights you can spend more time on your meal creations. You can also note the days that you have to be out of the house early and may benefit from packing your a lunch the night before. 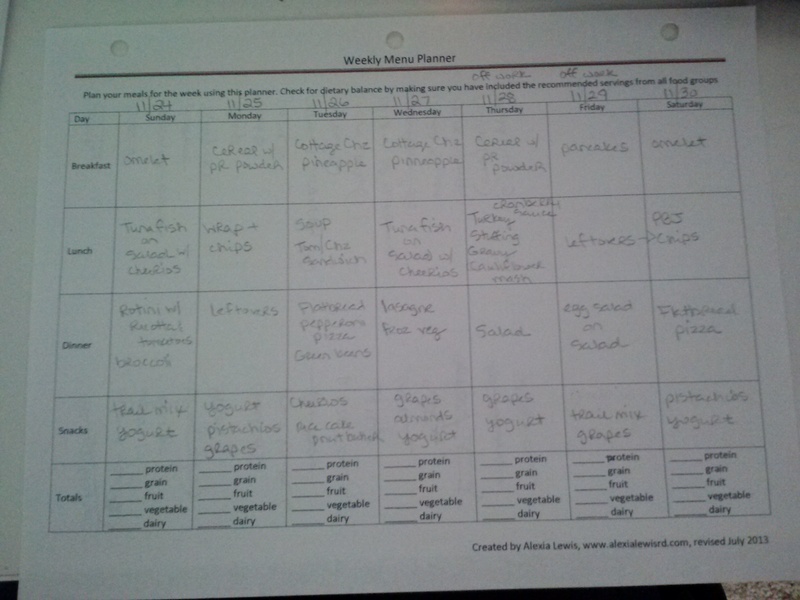 Write down everyone’s commitments that have an impact on meals on the weekly menu planner. What do you already have on stock, on par, or in your pantry and fridge? Flip your weekly menu planner over and make a list of all the foods in your fridge and pantry (your “stock foods”) on the left side of the back of the paper. Check the store promotions. What is on sale this week? What do you have coupons for? We all want to stretch our food dollars and this is one way to do it. If you don’t clip coupons, go to the grocery store’s web site as many are now allowing their customers to electronically collect coupons on reward cards or by their phone number. You can also check one of my favorite coupon sites, Southern Savers, for printable coupons. On the right side of the back of your weekly menu planner, write down the “promotions foods” you plan to buy based on sales, coupons, and promotions. Put on your creative chef’s hat, and invent meals you can put together using only foods on your list of “stock foods.” If you can’t make anything with what you have in stock, then figure out what you can add from the list of “promotion foods” to make a meal with your “stock foods”. The idea is to use as few foods from the “promotion foods” list so you make as many meals as you can without spending money on new foods! Once you have invented a few meal ideas, flip your weekly meal planner over and put the meals where they fit best based on your schedule. Google is your friend. I made this delicious Puff Pastry Tart just by putting “puff pastry,” “spinach,” “sweet potato,” and “healthy easy recipe” into Google! Cook more than you need so you have leftovers from every time you cook! A few tweaks and one night’s baked chicken, sauteed mushrooms and zucchini, and brown rice transform into the second night’s chicken quesadillas. Make the first meal on your weekly planner one that you have all the ingredients for… just in case you don’t make it to the store right away. This is the hard part and it takes time – so save every weekly meal planner you create to re-use for those weeks you don’t want to spend the time and effort doing all this work. Use the food group tallies on the bottom of my weekly meal planner to make sure you are including food from all food groups in your meal plans. Don’t know how many of each food group to include? Here’s a guideline based on a 2,000 calorie diet. Get out and run those errands! Use your list of “promotions foods” to make a shopping list. Clip your coupons. Go to the grocery store and do your shopping. You spent all that time and effort making a plan, now execute your plan. Post the weekly meal planner in the kitchen where you can see it. If you have helpers at home, let them know they can start prepping foods for dinners before you get home. Most importantly, be flexible. This plan is an outline and life happens. You may have forgotten you need fish for one dinner… just push that meal back to another day. You may decide that you are way too tired to cook one night… just pick up your plan the next night. Always have a Plan B Meal in mind. In my home, it is either flatbread pizza or turkey burgers and sweet potato fries. We always have the ingredients in stock and, on those nights we aren’t feeling our meal plan, we have a yummy 20-minute, low-effort dinner. Let me know if you like my strategy. I hope you ASPIRE to give meal planning a try this week!